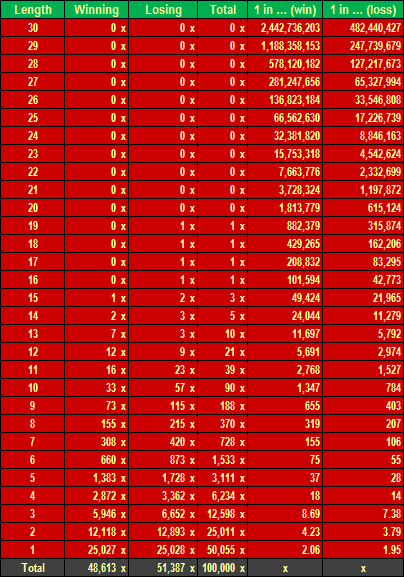 Once again the following test checks out the famous Martingale system in Roulette. It is also assumed that the minimum and maximum bets are limited. This time the minimum bet is very low (therefore "micro bets" in the title), which allows us to double the bets more times until we reach the top limit in case of a long losing series. Briefly to the principle of the Martingale system. We bet a specific amount of money on any even-money bet, e.g. red or black color with the payout 1:1. If we lose at any time, we double the previous bet and keep doubling until we win finally. This strategy may be very dangerous as we could see in the first grand test of the Martingale system with the limits $5 (min) and $500 (max). In this test the minimum bet is decreased as far as $0.10 (the micro bet) and the maximum bet will be tested in three different scenarios: $50.00, $100.00 and $500.00. The test will prove how significant is the room for doubling of the bets, i.e. the spread between the minimum and maximum bet, which are allowed by a casino. Such low minimum limits can be used by some internet casinos for instance. However the limits can vary from casino to casino, so it is always good to get familiar with them before playing. The second test of the Martingale system – with the low minimum bet (micro bet) – is again carried out by means of a random simulation of 100,000 roulette spins in MS Excel. The first 20 spins are shown on the Table 1. In order to be able to compare the impact of various limits, we used the same numbers that were generated in the first test – thus we used the same sequence of 100,000 randomly chosen numbers. Let us go over the test conditions. We play the French Roulette with only one zero, which is more favorable for players. We always bet on the red color as it is completely indifferent from the probability point of view as if we bet on the black color or alternated the colors. The choice of the color has no impact on the result of the test. The bet is lost if a black number or a zero comes out. We could well use also the other even-money bets such as low/high or even/odd numbers. The table headings have already been explained. Just a brief recapitulation. "Spin #" ranges from 1 to 100,000. "Number" is a randomly generated winning number. 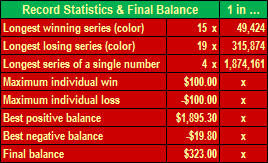 As we always bet on the red color, we are interested mainly in its color (each number has a fixed color). We start betting with the minimum $0.10. "Profits/losses" are net outcomes. 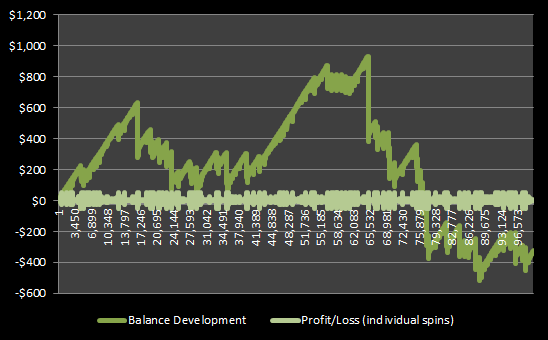 They are added to the running "Balance" (of course the losses are deducted from by adding a negative figure). Our initial balance is null, so we can imagine we have enough chips in our pocket and we can dig out any amount we can to cover (or raise) the losing bets. Final balance after spin no. 100,000 is the (net) result of the test. The progress of the test is best displayed by a chart. 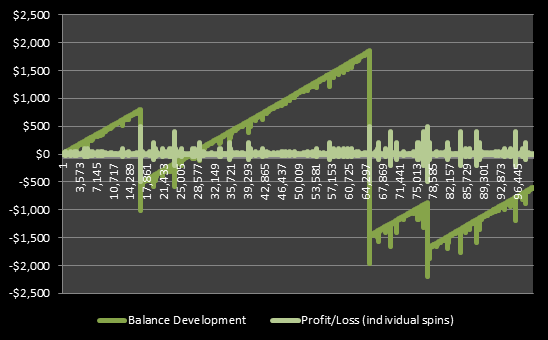 The horizontal axis (x) presents the spins (1 to 100,000), while the vertical axis (y) shows the balance (darker green curve) and the profits or losses in individual spins (lighter green curve). 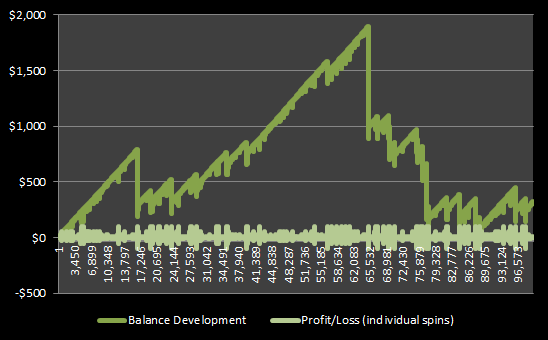 If we compare the course with the first test of the Martingale system (whereas the limits were $20.00/$500.00 and corresponded to some stone casino) we can notice that the balance development in this test is far more favorable. The test with the limits $0.10/$50.00 ended in the negative territory, however the positive balance had been kept for almost three thirds of the spins. The point is that there is a bigger room to double the bets, we can double them several times more before we actually hit the maximum bet allowed. Table 2 shows the records that have been measured throughout the test. The red color came out 15 times is a row. The longest losing series took 19 spins – either a black number or a zero came out in 19 successive spins. The probability of such event is only 1 in 315,874. The frequencies of all winning and losing series including their probabilities are shown on the Table 3. The same number came out four times in a row. We know that the probability of this event if 1 in 1,874,161 only. The number 1,874,161 is actually fair odds, whose meaning is the same as in sportsbook. However such high odds would be hard to find. The maximum individual win and loss was $50.00, which is not a surprise as this is the top limit. On the other hand we can see how many times the initial bet $0.10 was multiplied until we reached the maximum limit $50.00. If we stopped playing Roulette in the best moment of the test, we would win $933.30 netto. 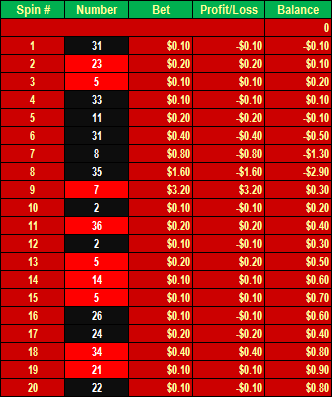 We had the worst time close before the end of the test with the loss $517.40 and we finished with the final loss $328.20. Now let us raise the maximum bet to $100.00. Looking at the chart below we can see that the progress of the test is much more favorable as regard a player's wallet. With the same minimum bet $0.10 and raising the maximum limit to $100.00 we would even be able to overcome the final not-too-favorable stage and finish in the plus. The exact figures are given in the Table 4. We can notice that the maximum positive balance was better as well. If we stopped playing in the best moment (however it is impossible to know during the course of play) we would win $1,895.30 practically out of zero. Moreover we were almost not in the red. The worst negative balance was -$19.80 only. The final balance was plus $323.00! First let us highlight again that, during this test of the Martingale system, we still use the same numbers that originated in the simulation of 100,000 Roulette spins in the first Martingale test. That is regardless of the maximum bet. The minimum bet is still the same $0.10. We could see that the previous raise of the top limit to $100.00 paid off and that we actually finished the test with the positive balance. Thirdly we raise the maximum bet to $500.00. The outcome is best caught by the chart below. We can notice that the development of the balance with the top limit $500.00 is now much more volatile, if we use the expression used in the stock markets (volare = to fly in Italian). The curve is seesaw, up-and-down. As we can see we reached the top limit $500.00, even though we had started with $0.10 bet and we started over with $0.10 bet anytime we had broken a long negative series. To stop in the best moment would bring us the net profit $1,850.50. The critical was the third quarter of the test again, when we fell into the loss of $2,193.10. But finally we made it to the loss of $597.80. In general a bigger spread between the minimum and the maximum bet is more advantageous, since we can double the bets more times in a row, but it is no guarantee of the positive outcome. It also depend on the length of winning and losing series and their timing, as with the greater top limit and bad or unlucky timing you can also lose more, which can be demonstrated by the look at the last two charts (Figures no. 2 & 3). In this case the limit $500.00 did not prove to be an advantage as we finally ended up with the loss of almost $600.00. Anyway this outcome was far better than in the first Martingale test with the same top limit $500.00, but with the minimum limit $20.00. There it was not possible to double as many times as in this test and the first test finished with a terrible loss of $31,300. You may be also interested in the third test of the Martingale strategy with unlimited bets.